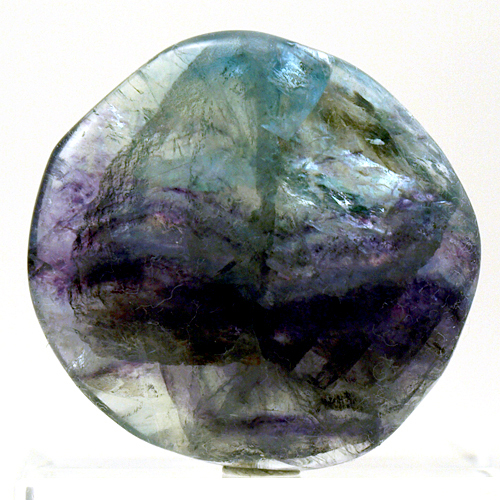 Dimensions (HxWxD): 1.5" x 1.5" x 0.45"
This lovely & smoothly polished piece of rainbow fluorite is a perfect 'worry stone' or should i say not-to-worry stone! It's small enough for your pocket or to hold in your hand while meditating. It's also very useful to place on the body during a treatment or session with a client or patient. The colors range from saturated violet and blue and green to pale green & pale violet. Each one is wonderfully smooth and feels good while holding or stroking, it is truly calming to the nervous system. Each disk comes with a little velveteen pouch for safekeeping! Note: Actual Average Weight is 23-30 grams. Each piece is unique and may vary in coloration, pattern and dimensions. Each piece is guaranteed to be beautiful and to meet with your complete satisfaction!